Right this second, I’m on a train to Charlottesville, VA for the Virginia Festival of the Book, with fellow Polis Books crime writer Rob Hart – who writes the acclaimed Ash McKenna series. 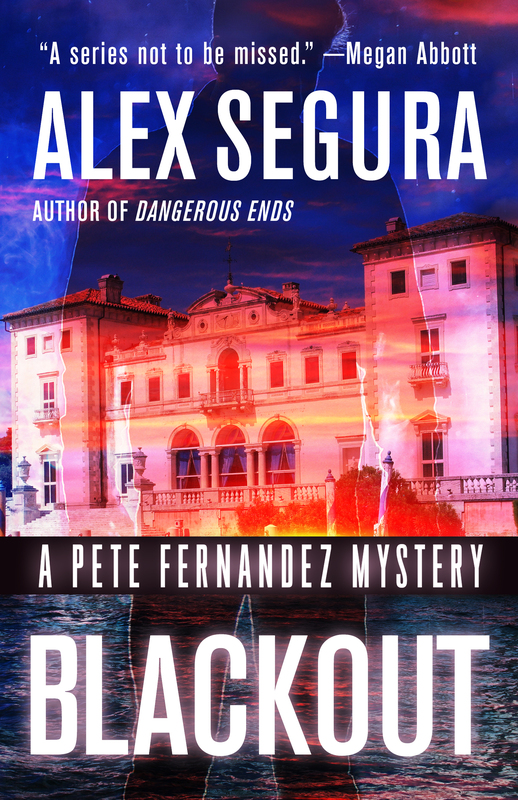 In a more macro sense, I’m prepping for the launch of Blackout, my fourth Pete Fernandez Miami Mystery, which hits on May 8, also from Polis. In the book, Pete Fernandez is pulled back to his hometown of Miami when a frigid-cold case bubbles up to the surface again. This is a case that’s haunted Pete since before he even decided to become a PI, and is somehow tied into a once-thought-dead cult. It brings Pete face to face with his own mistakes, and how his addictions prevented him from solving the crime when he had his first chance. It’s a story about second chances, making the most out of the time we’re given and how we deal with regrets, wrapped in a dark, tropical Miami bow. PDB: Do you listen to music when you work? I don’t, actually. I need absolute silence while I work. But I do think about music a lot, and I listen to a lot of music when I’m plotting or planning a novel. For Blackout, which deals with obsessions and past mistakes in the form of a fading, deadly cult returning to prominence in Miami, I found myself listening to a lot of Velvet Underground, Neil Young, Sonic Youth, Jason Isbell, St. Vincent and the Breeders. PDB: What makes you laugh? Awkward, anxiety-inducing humor – the best examples I can think of off the top of my head is stuff like Curb Your Enthusiasm or It’s Always Sunny. Jokes that make you laugh, think and cringe at the same time. PDB: What’s the best cure for a hangover? PDB: If you could live anywhere in the world, where would it be? I live in New York now, which to me is as metropolitan as you can hope for, in terms of culture, people, food, variety. It can be exhausting, but I love it. PDB: Do you have a bucket list? If so, what’s on it? Not a literal, written list, but I do have goals I’d love to achieve. Some of them have happened already, which is exhilarating. I’d love to see the Pete books adapted in some way, that’s definitely on there. PDB: What’s on the cards? Finishing up co-writing The Archies comic book series. In the early stages of the next, potentially last Pete book slated to hit next year, then a standalone crime novel. Some comic book stuff I can’t talk about yet. Thanks for having me! I hope people enjoy Blackout. Bio: Alex Segura is a novelist and comic book writer. He is the author of the Pete Fernandez Miami Mystery novels, which include SILENT CITY, DOWN THE DARKEST STREET, and DANGEROUS ENDS, all via Polis Books. He has also written a number of comic books, including the best-selling and critically acclaimed ARCHIE MEETS KISS storyline, the “Occupy Riverdale” story, and the ARCHIE MEETS RAMONES and THE ARCHIES one-shots. His work has appeared in the anthologies PROTECTORS 2, WAITING TO BE FORGOTTEN: STORIES OF CRIME AND HEARTBREAK INSPIRED BY THE REPLACEMENTS and APOLLO’S DAUGHTERS and in publications including The Daily Beast, The Los Angeles Review of Books, Literary Hub, The Strand, Mental Floss, LitReactor, and more. A Miami native, he lives in New York with his wife and son. Copyright © 2019 Paul D. Brazill. Buntu by Nilambar.